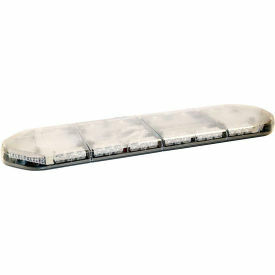 Buyers Products 49 Inch Amber/Clear LED Modular Light Bar comes with 36 Amber LED strobes. The amber light bar is SAE Class 1 certified and has a CA13 rating. The 49 in. light bar operates at 7-14 amps and features a dimming mode. It comes with a 10 ft pre-wired power/function cable. Middle strobes have three LEDs and corner strobe heads have six LEDs. The light bar has an extruded aluminum frame with two recessed mounting channels. Mounting feet and controller are sold separately. Light bars can be customized by adding your choice of amber, blue, clear, and/or red strobes sold seperately. They are backed with a 5 year warranty.